RECOMMENDED: If you’re looking for a quality resource to learn Turkish with, I highly recommend this one. Since we’re now in the run up to the ANZAC Centenary (the most sacred event on the Aussie and Kiwi calendars) I thought it would be fitting to help those of you who are interested in learning Turkish. Today I’ve revisited and repurposed a guest post from Aaron Myers of the (now sadly defunct) Everyday Language Learner blog. After having spent some time living in that part of the world with his family, Aaron learned an impressive level of Turkish (see the video I’ve posted below). This is a major point of interest for me personally as I’ve lived in Turkey and spent quite a bit of time learning it. 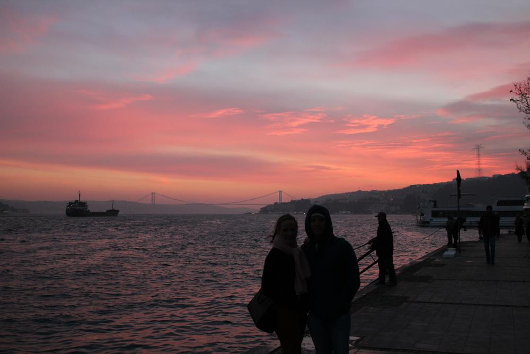 I stayed in Turkey again a few months ago (that’s my girlfriend and I at sunset in Istanbul) and it’s made me want to pick up Turkish again so much! It’s definitely one my favorite places in the world and a language I love. Before we get into the guest post by Aaron, I thought I’d just list a few excellent resources here to help you get started. Both of these are paid resources and have a very similar lesson style (podcast) that’s more geared for new to intermediate learners. For free sites that explain the grammar of Turkish comprehensively, these sites do a good job of it (no audio though unfortunately). There are some excellent vocabulary lessons on Memrise (especially the ‘Hacking Turkish’ ones). Also if music helps you learn languages, my friends over at Earworms Musical Brain Trainer have a Turkish edition available called Rapid Turkish (see my review here as well). Would you recommend another online resource? Share it in the comment section below. Riding the mini bus toward my new apartment in the middle of Istanbul my palms began to sweat. The walking bridge with it’s arched blue beams was quickly approaching and with it came my point of disembarkment. I’d learned a new phrase today – memorized it really – for I had no idea what it really meant, but I knew that if I said it, and said it loud enough for the driver to hear, the bus would pull to the side of the road, the doors would swing open and I would be able to step onto the walk leading home. I’d heard others say it time after time in my week and a half in Turkey and it always worked for natives. But the question remained – would it work for me? The problem was actually in the spitting out of this new cacophony of sounds and syllables, so strange to a tongue that had only traipsed the English and Spanish languages. And so there I sat, note card in hand, silently whispering it over and over again. The bridge approached. Despite the fact that I had little command over the grammar or even meaning of what came out of my mouth, the bus driver slowed, pulled to the side and threw the door open. I stepped out into the fresh air and sunshine, let out a deep sigh of relief and rejoiced. Turkish is a wonderful language. As it marched across the the steps of Central Asia from Mongolia to Turkey a thousand years ago, so it marches across the page today in tight strides with little time or energy for exceptions to the rule or irregularities. With scientific precision its alphabet was converted from the Arabic to the Latin script in 1929, assigning one sound to each new letter. This is where the easy parts of Turkish lets off though. Turkish is a S-O-V language meaning that the subject is followed by the object which is followed by the verb which always brings up the rear of the sentence. Turkish is also highly agglutinating, meaning that it uses a lot of suffixes and infixes to mark or modify words. English too is agglutinating giving us words like suffixation, enjoyment and education. But where English adds an occasional suffix or two, Turkish regularly uses several stacked right on top of another each adding a grammatical feature to the word; negation, passivity, mood, plurality, possession, questioning and many more. It has 70 letters and means “As though you are from those whom we may not be able to easily make into a maker of unsuccessful ones.” Not a word anyone would use in normal conversation, but an example of what one can do with agglutination none the less. Another aspect of Turkish that takes some time to get used to is its demand for vowel harmony, the phenomenon in which all the vowels in each word must be of the same class, i.e. all front vowels or all back vowels. And of course like many languages, there is a whole range of Turkish grammatical structures for which there is no real equivalent in English. As a Turkish language learner myself I will in no way claim fluency over the language, but as someone who has worked to learn it in an independent, self-directed manner over the course of the last four and a half years I will offer a few pieces of advice that I hope will make your journey toward fluency in Turkish – and perhaps any language – more enjoyable and successful. As a language coach, I’ll always encourage my clients to think about their personal learning style. There are literally hundreds of resources, activities, methods and opportunities to learn Turkish – you just need to find what is the right one for you. For me that was with a language helper, a young college student who was my Turkish resource and who now as well is a good friend. Like any new language, Turkish is filled with both new sounds and new sound patterns. These are at first strange to the ear for an English speaker and completely foreign to the tongue. By listening early and often, learners will begin to train their ears to these new sounds and sound patterns even before understanding meaning. This is especially important for Turkish with its use of vowel harmony. You cannot pronounce it correctly if you cannot hear it and you will not be able to hear it until you’ve heard it a lot. So go online and find podcasts, videos, music, movies or radio stations and begin listening to Turkish right away. Finding input that is comprehensible is key to beginning to to actually understand and speak Turkish. For me, comprehensible input began Saturday mornings with Dora the Explorer and my two kids. High quality comprehensible input can come from nearly any source, but the main idea is that you should be able to understand the message behind the sounds. Not every detail, not every grammatical function or even every word, but the message behind the sounds you are hearing. In the early days on the bus in Istanbul, I would routinely hear Turks say phrases that caused the driver to stop the bus and allow them to get off. I didn’t understand what was happening grammatically in the phrase “musait bir yerde inebilirmiyim” for some time after I began using it. I had rather made a direct connection between a phrase and it’s meaning. I had acquired the language rather than learning a word for word translation. And acquisition will always be deeper, more meaningful and longer lasting than learning. While working to get massive amounts of comprehensible input was the back bone of my journey to learn Turkish, I also used a number of different text book type of resources to help fill in the gaps, gain understanding and get much needed practice with the new concepts I was learning. My favorite for Turkish as a beginner was the Teach Yourself Turkish book. I worked through the sixteen chapters over the course of about seven months, giving myself plenty of time to camp out in each of the new concepts and practice using them. 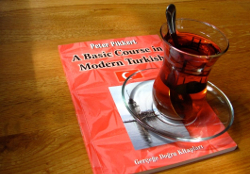 Another great resource is Peter Pikkert’s A Basic Course in Modern Turkish. This is a simple grammar text with no exercises or dialogues, just explanations and examples. It is simple and to the point. There is not one thing anyone can do to master another language. Each day as I was learning Turkish I tried to listen a lot, to read, to write, to speak with others and in the course of conversation, to listen as well. I used flashcards, a pocket dictionary, my ipod, a text book, I journaled daily and used a host of activities and tools to help me gain access to Turkish out in the community. It was a well rounded personal program for learning the language and it worked. Turkish is spoken by over 70 million people. Turkey is also a rising economic and political power whose influence is growing throughout the world. If that isn’t reason enough to start learning it today, Turkey itself is a beautiful country filled with immense cultural heritage and tremendous natural beauty. Book yourself a ticket and begin learning Turkish today. This is a really good post, with lots of good things to take away. I particularly like the sentence "acquisition will always be deeper, more meaningful and longer lasting than learning". I'll definitely be trying to remember that going forward. Just that sense of being able to communicate, even just a little, at the beginning, is invaluable, and it's something I'm trying to force myself to do more and more. I had it in Spain this last week (and have blogged about it), and it's a great feeling to force yourself to do it, and come away having succeeded in communicating – and getting the desired results. Having there be some necessary reason for the communication – getting off the bus, getting a plate of pasta – strengthens that need and that relationship, and makes it more real. Thanks for the comment. Glad the acquisition vs. learning idea made sense. It's been an important distinction for me. Aeron is not bad at speaking Turkish, I can understand everything he says as a native Turkish speaker but he needs more practice on Turkish pronunciation. He is actually pretty good. Congratz. Wow, I understood most of that. This was a great post too, I'm so excited to find the listening library! I currently live in Turkey and have really wanted to meet up with a college student to practice Turkish and for them, English. How did you go about doing this and at what university? If you could email me, that would be great. I have been learning Turkish for nealy 40 years now. For me, there is still so much to learn even now. 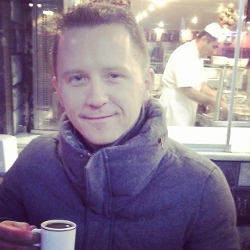 How to learn Turkish – or really, how to learn anything well. Your study in language will be much like your study in school; you develop so much in one grade to prepare yourself for understanding in the next. There are to be times when the road will seem a bit rough, but console yourself with the thought that the final goal is more than worth the effort. All over the world students meet the same problems, and overcome them just as you surely will. Acknowledge your ignorance and grasp every opportunity to learn. Look for criticism, and never be ashamed to ask questions. Choose your company wisely. Avoid those who would undermine your resolution. Seek those who will stimulate you to better efforts. Know that enjoyment in language aquisition goes in direct proportion to ability. Always aim high – up and up. Recognize difficulties for what they are – stepping stones along the way to test your will. Once surmounted, they will spur you on. Stick by your guns. Know that then you canl attain your goal, however long the road, whatever the obstacles. Fortify yourself with firm resolution. Stubborn resolve will bear you up when strength is needed. Know that success lies within you. Know that firmness of purpose and perseverance are prerequisites of success. Cast doubt from your mind and believe in yourself. I'm a long-time Turkophile. If you go to the PowerTürk (large radio station conglomerate) website and stream their pop music channels, they include lyrics for most. Awesome for colloquial phrases and listening. The Foreign Service Institute's Basic Turkish Course is dated but still awesome for listening and basic grammar. Thanks for the recommendations, Justin. I’ve been using Duolingo for a while (it’s out of Beta, now! ), and I find it very useful! After reading your post, I’ve also taken a look at Turkish Basics: it’s wonderfully clear to me! ”anzac” day, centenary or otherwise, is NOT the most sacred day on the australian calendar. i feel you’d do well to more carefully considered your choices of sentences, left in perpetuity on your website. I am offended by this intimation. on one hand there’s all the media propoganda and romanticisation of the war event. The medias inclination to describe present day soldiers as ‘diggers’ and whatever. And the same large component of the population are absolutely bewildered by why anybody would want to go on a ”pilgramage’ to Turkey to meditate on the mass blood sacrificial ritual. You call the day ‘sacred’ ? a search for ‘myths behind anzac day’ or ‘lies of world war 1’ etc will reveal a ton of articles. Wanted to share this with everyone else here interested in learning Turkish! Btw if you want a free trial lesson, just message him about it 😛 Hope this helps anyone here who isn’t able to find teachers nearby!! Logic Reigns Supreme – or Does It? They say that Turkish is easy to learn because it is so logical. The grammar is logical and there are very few exceptions to any of its syntax rules. There is no gender, no masculine, feminine and neuter forms to master, so it must be easy. And so they say thus: the Professors, the Teachers, and especially native Turks themselves. They say it is ‘so’ easy. “Why?, Doesn’t a Turkish child learn to speak its mother tongue at a very early age?”. You may have noticed that the professors, the lecturers and the native speakers state that this facility is so; however you may go on to notice that this list does not include Turkish Language Learners. Ask any of them, or should I say ‘any of us’, and for the most part you will receive an answer quite to the contrary. A resounding “No! Turkish is so difficult, I’ve learned the rules but I still cannot understand or make myself understood!”. So the learning road is littered with fallers by the wayside, triers to the man, but despite their industry it is all to no avail and so another well intentioned learner disappears into the distance, consumed by disappointment and their lack of success. They took their courses, they went to their classes, they watched their videos, they listened to their sound tapes and at the end of it all your friendly “Merhaba nasılsın” is met with a blank stare of misapprehension and you can see panic setting in in their eyes. So why is it so? Let us try to give an explanation not only to ourselves, the poor misunderstood Turkish Learner but also to the all the Professors and Teachers and Native Turkish Speakers who say that as Turkish is so logical then it is therefore so easy to learn. Well, in these days of computing and programming, let us give an analogy, (a similarity between like features of two things, on which a comparison may be based). How many of us in our forays into computer programming, be it Visual Basic, Java Script or any programming language which is built on logic and which has its own syntax rules, have spent more time debugging our efforts to produce a successful result than actually being able to use our programming “skills” naturally and with ease? Even when we have learned the rules of syntax of any particular computing language we still meet the stumbling block of logic. Consequently, until everything is in its rightful place our program will not flow and run successfully. In our debugging trials we often have to take the way of seeking examples, be it from a book, from the world-wide web or maybe we enroll for some course or other in order to increase our ability in our endeavour. The Problems of Learning Turkish. 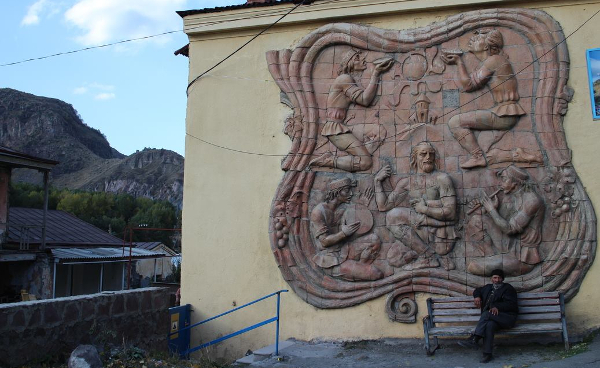 This was the situation that I found myself in when I went to Turkey to work in the late seventies. I did not know a word of Turkish, and at the age of forty-five I had to start somewhere. I bought a grammar book and tried to learn the rules, Vowel Harmony, Consonant Change, Affixed Post-positions (agglutination), Verbal Nouns etc. We realize that rules can be learned, but as in computer programming it is their application which becomes difficult especially when the logic of the Turkish Language is so different to that of our own mother tongue English. Moreover we are trying to apply these rules and logic to a completely different dialect. This is why Turkish is very difficult for us English Speakers. Yes, the Professors, Teachers and Turkish Speakers are right; Turkish is an extremely structured and logical language, as proven by the fact that Turkish children learn to speak it very early in life, but it is this internal structure of the language which defeats us foreigners in our learning attempts. We just cannot “think Turkish!”. We never learned how to, and probably many of us never will be able to think with Turkish logic. So even after many years of trying to learn Turkish we are labelled as speaking ‘Tarzanca’ in the manner of the film hero ‘Tarzan of the Apes’ as only the best we can do is akin to “Me Tarzan!, you Jane!”. After 34 years of learning I can tell you all that Turkish is very difficult for us English Speakers. I’m learning Turkish with tutors here. It’s a good source and I started to practice speaking. But even now I’m looking for new opportunities to try something new in language learning. If you know some great ways you tried yourself, let me know, please.I’ll be glad. I am starting Turkish classes at the University of Washington in two weeks and I appreciate this list of resources. I like the story of the bus phrase because I just spent a year in Georgian learning Georgian and the parallel Georgian phrase, though shorter, was something I learned similarly. It is important that the mashrutka stops where you need it to stop! i am a native speaker if you want to learn turkish i can help for all person.